My sister and I tried our first ever dragon fruit few years ago and we fell in love with it! We saw many times in a local supermarket but did not want to be too adventurous. But we were curious because we never tried this funky looking fruit in our hometown even though we can find it there. First impression was it tasted bland but very refreshing. "Bland isn't the word....it's tasteless!" said my youngest sister and brother. I eat this fruit all the time BUT I had no idea about where and how it grown, what kind of plant they came from and the benefits of eating it. I guess some of you might not know about these too. So I did some searching. 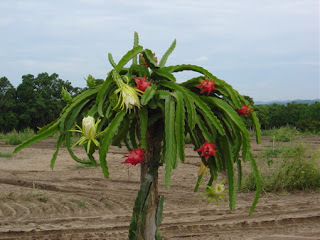 Dragon fruit is actually a fruit of a cactus tree! 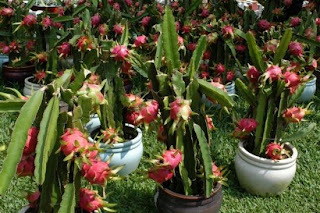 The Dragon Fruit (also known as Pitaya or huo lóng guo), origin and native from Mexico, Central and South America. Now, the main cultivate are in Vietnam, Malaysia and Taiwan. Usually, it is grown in the tropical lowlands. It is a tropical fruit. It can be grown with organic fertilizer, without any pesticide and chemical. 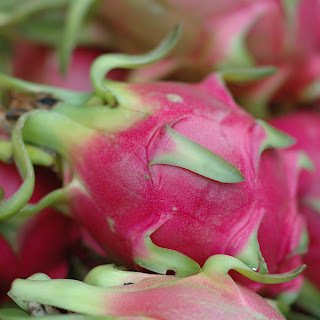 Therefore, dragon fruit gain its reputation on the market as a healthy fruit. This fruit does not grow well in winter cold or summer heat, so its availability is limited, making it a highly prized treat. 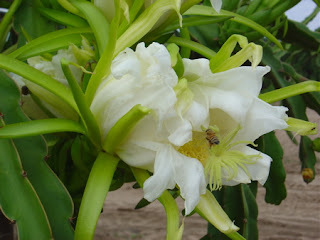 It only blooms at night; they are large white flowers that are often called Moonflower or Queen of the Night. The fruit is rich in Vitamin C and water soluble fiber. It is also claimed to have a high nutritional and medicinal value such as cleanse body toxins, reduces high blood pressure, lower cholesterol, regulate blood circulation, stabilize blood glucose, strengthen immune system, improve digestive system, relief body heatiness effectively, prevent cancer, enhance smooth and beautiful complexion. Some say that it has the functions of improving eyesight and preventing hypertension. It is also used to flavor drinks and pastries. Besides the fruit, unopened flowerbuds are cooked and eaten as vegetables. With all these qualities, do I have to explain why it referred as the fruit of "the 21st century"? 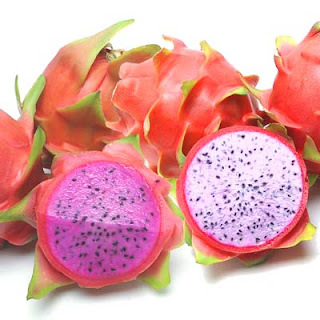 Why it's called dragon fruit is beyond me. Does anyone know?